Before I begin this post, I would like to thank Jaishree for passing those wonderful awards to me. I am really honoured Jaishree. Thanks so much. Also thanks for all my friends who gave suggestions about the Turnip leaves. This is based on how I make this poricha kootu. Just pressure cook toor dhall, moong dhall and chow chow adding the turmeric powder, upto one whislte. In the mean, fry the ingredients given for grinding to golden brown. Let it cool and grind it into a fine paste. Pre heat a pan, put the cooked dhall+vegetable mixture, adding required amount of water, grounded coconut paste and salt and let it boil nicely. Add water if necessary to get the required consistency. Turn off the stove when you get the required consistency. Pre heat oil in a small pan, splutter mustard seeds, add urad dhall, curry leaves and red chillies and fry it till it becomes golden brown and pour it on top of poricha kootu. Garnish it with curry leaves. Enjoy this with rice, chapathi. Nice koottu :) We also make this with cabbage and use payaththam-paruppu. I am a fan of kottu. Looks good! Nice Kootu. 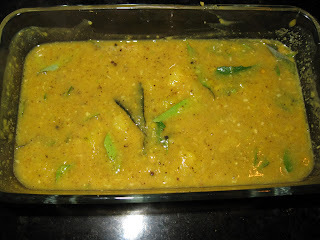 I used to make with moong dhall and only urad shall for grinding. Nice kootu. Amma use to make this. love this. This should be perfect, I can't wait to try it out. Well written article! You should post it on Post a Comment. They have a bunch of similar articles and you can link it back to your website. I have one posted on it and it is awesome because they give you some graphs to put on your page to track how many people read your article and it tells you how useful they thought it was. I think a lot of people could use to read your stuff and I think this will help get your articles out there more! This does sound delicious with all those lovely, colourful ingredients. I love poricha kootu. My husband and I love this recipe. have made it 3 times in a month. Now your picture made me hungry. I can't wait to try it. thank you for sharing your post.